The residents of North Queensland are counting the cost after cyclone Yasi, the largest tropical storm to strike Australia since Europeans first settled there, created winds of 186mph and waves more than 9m high. As meteorologists predicted, it was midnight when the destructive core of the category five cyclone crossed the coast at Mission Beach, a small resort where two World Heritage sites meet, 30 miles south of the town of Innisfail. Thousands of the 400,000 people living in the path of the 300-mile wide cyclone spent a sleepless night in hot and crowded emergency evacuation centres set up in primary schools and shopping centres deemed strong enough to withstand the cyclone and avoid storm surges up to 8m high. Roofs were torn off pubs and houses in Ingham and Innisfail, which was flattened by cyclone Larry five years ago. Locals said Yasi had already caused more damage than Larry, which wrecked 10,000 homes but did not cause any fatalities. In Tully, where about 60 terrified backpackers sheltered in a pub as rainwater swept through the doors, local councillor Ross Sorbello ventured out of the car in which he was sheltering during the eye of the storm. "It is just a scene of mass devastation," he said. "Larry was a boy compared to this." With power lost to more than 150,000 homes, some evacuation centres also lost electricity. In one centre in Innisfail, where 70 people were sheltering, residents were forced to hammer extra wooden boards on to the bottom of doors in an attempt to stop water flooding inside. The readiness of Australians for Yasi was in stark contrast to cyclone Tracy, which struck Darwin on Christmas Day in 1974 and took many people by surprise, killing 65 and destroying more than 70% of the city's homes. After plenty of warnings to leave vulnerable and low-lying homes, evacuation centres became so full that people were turned away. While extra flights were laid on out of Cairns, some residents claimed they could not afford to leave the city because the cost of flights to Brisbane soared to A$1,500 (£930) in the final hours before the airport closed today. As the army and emergency services urged residents to get off the streets and leave vulnerable properties, an eerie emptiness settled on the usually bustling tourist resort of Cairns and the regional city of Townsville. The only eyes on the cyclone were from webcams recording the battering of buildings by winds that caused palm trees to double over. "The authorities were really relentless about getting people out," said James Woodford, an author and environmental blogger who was sheltering with his family in Townsville. "My impression was that the army did get everybody out who needed to get out." But Queensland police reported that some people still refused to leave their homes, hoping to defend their properties against damage from the storm. The deputy commissioner of police, Ian Stewart, said a group of six people in their 60s in the coastal settlement of Port Hinchinbrook had called emergency services and asked to be evacuated late on Wednesday night but the authorities turned down their request because by then it was too late. Stewart said it was "really unfortunate" that the group had ignored repeated earlier requests to evacuate, and said they had been advised to shelter on the second storey of their apartment block in the hope this would be high enough to escape surges from the ocean. Others were better prepared. Speaking from a specially designed cyclone bunker she had built beneath her home in Jubilee Grove, Hayley Leonardi said Yasi sounded "like a roaring train going over the house. There are trees cracking outside. It's a bit scary really." In Cairns, Louise St George, an events manager, had been due to fly south with her partner, Andrew Saville, for a wedding. But when Cairns airport was closed because of the oncoming storm, her flights were cancelled. Fleeing their low-lying home in the beachside suburb of Yorkeys Knob, they hunkered down in a bathroom on the fourth floor of the Holiday Inn, a concrete building in the centre of Cairns built to withstand category-five cyclones. She described the calm before the storm as "creepy" and "tense" but said she was "trying to be calm". At 3.30am local time, a spokesman for Queensland police reported no deaths or injuries, although he said the extent of the damage would not become apparent until daybreak. 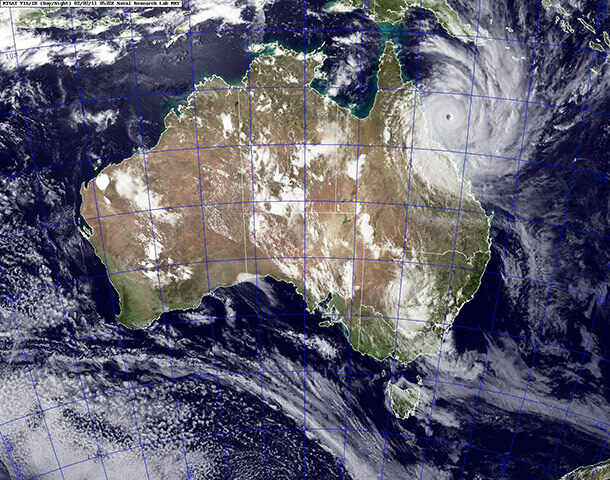 Jonathan Knott, professor of geomorphology and natural hazards at James Cook University, told ABC television that while cyclone Yasi was the type of more intense cyclone that could occur as a result of global warming, there was insufficient data to attribute one violent event to climate change. He praised the emergency efforts but said Australia needed better systems for preventing people being put at risk in the first place. "We are really well prepared when the emergency is upon us. When danger is looming, we do a fantastic job of evacuating people," he said. "We're not so good at mitigating against hazards. We're allowing people to build in very low-lying areas that are going to be impacted by these sorts of cyclones." The cyclone is another blow to North Queensland's massive coal industry, banana and sugar cane growers and its tourism businesses, just when the state was open for business again after the floods in December and January, which left 35 people dead. Although the night was long, dark and filled with anxiety, Australians also greeted the threat of the cyclone with black humour and defiance: on the plywood sealing up the front of the Hog's Breath Café in Cairns, were sprayed the words: "Kiss my Yasi".